I bought my (unlocked) Nokia 1600 cell phone about five months ago. I had been looking for an efficient, basic and inexpensive cell phone that had to fit easily in my shirt's pocket. I use it with a prepaid minutes scheme in non-professional conditions. I did not feel any need for multimedia applications like built-in camera, MP3 player and the like. My simple needs were to be able to send and receive both vocal messages and SMS in a convenient way. I have been using almost exclusively Nokia cell phones since 1998 as they operate in a very intuitive kind of way. As proof of this, the Nokia 1600 comes with a very simplified user's manual that experimented users can easily skip: once you buy it, you almost immediately get going. My experience with the Nokia 1600 is that it is quite ergonomic and features a superfine (and I mean: SUPERFINE) LI-Ion battery that goes on seemingly forever. This is a decisive advantage at this price point. Hundreds of addresses can be stored (more than I'll ever need) and up to about 60 SMS can be stored. Although colour was not a prerequisite, I enjoyed the standard colour display. Moreover, my tired eyes long for the large size fonts available. The main drawback is tied to its ultra light weight (80,3 gr) as the unit's shell structure only ensures moderate durability if dropped repeatedly (although mine already survived quite a few stressful events!). A minor drawback is that I really miss the "polite" Nokia ringing tone. Sound quality and network sensibility deserve a solid 4-star rating. SMS use is good but not really outstanding and I would award this feature three stars. I also dig the joint alarm clock and reminder options as my vintage memory cells keep worsening. Another interesting feature of this model is the ability to lock the phone with a five-digit secret code, as I like to enjoy a little bit of privacy. I should also add that I still own two other Nokia cell phones: an obsolete, but damn solid, Nokia 3410 (that I keep as an occasional back-up) and a very good, more upscale Nokia 6101, which I exclusively use for professional applications. Three years ago, I offered a still older Nokia 3210 to a friend of mine and it is still performing very well. 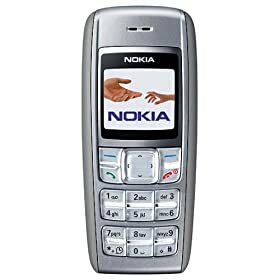 If all you will ever need from a cell phone is the possibility to conveniently make or receive contacts with other people, this inexpensive Nokia 1600 unit is the right choice for you!